Aspects are angles created by the varying positions of the planets in the sky in relation to one another. Some aspects are harmonious, while others breed challenges. 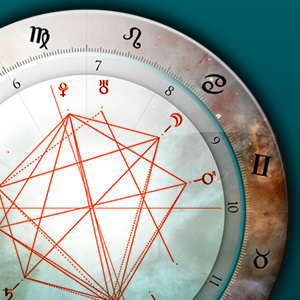 Astrologers are able to assess what conditions will be present and for how long by evaluating these aspects. For instance, if communication and data planet Mercury is up in the sky creating a 90-degree angle (called a "square") to aggressive Mars, this could be a warning sign that you may argue with someone, or get a speeding ticket. At the same time, Mercury might be creating a 120-degree angle (called a "trine") to expansive Jupiter, indicating it's a great time for a short trip. This might seem contradictory at first, but on any given day, it’s common to come across various, conflicting energies. You could read it as "It’s a great day for a short trip -- just remember to watch your speed!" Or, "You have a lot to say, but be willing to listen to others' points of view." Astrology works best when combined with your own common sense and intuition. Aspects are angles created by the varying positions of the planets in the sky in relation to one another. Astrology affects your horoscope ... and your life! The cosmos hold the key as planets, aspects and houses all work together to influence the way we live.